As smartphones have advanced, and the display and photo capture technologies have improved, many have desired the ability to design and to edit images on their mobile phones. In fact, today hundreds of design applications exist on Google Play (previously known as Android Market). So in order to help you sift through the noise to find the ideal one for your needs, we decided to take a look at our top twenty designer apps for Android. 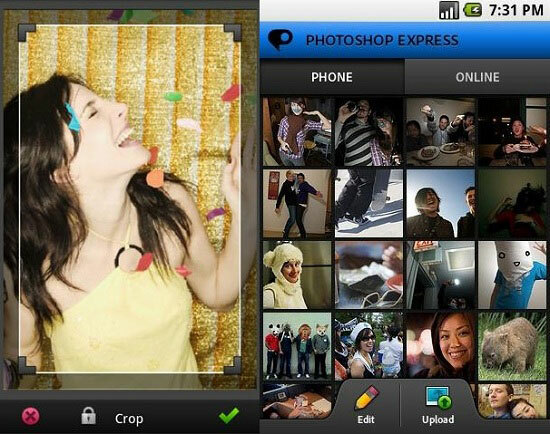 Photoshop express is an application based around the hugely successful computer program of the same name, but now adapted to mobile phone use. 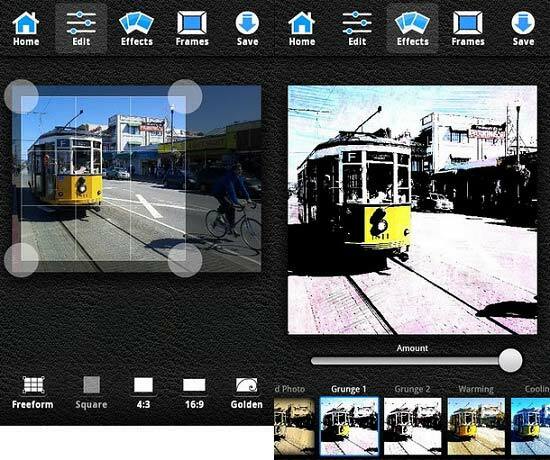 Though the app doesn’t have all the functions available on the PC version, it remains extremely popular for a wide range of photo editing functions. WordPress Mobile is a simplified version of the popular website blog managing software, which enables users to update, edit and create new websites straight from their smartphones. Ideal for any person who requires round the clock updates for their websites. 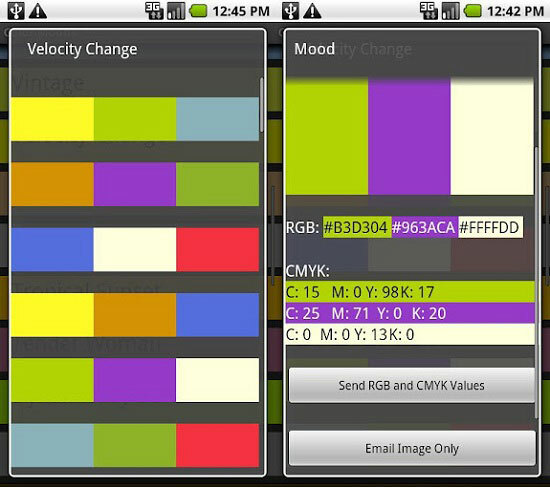 This useful application enables users to search and discover a variety of colors that can then be used in different design purposes. 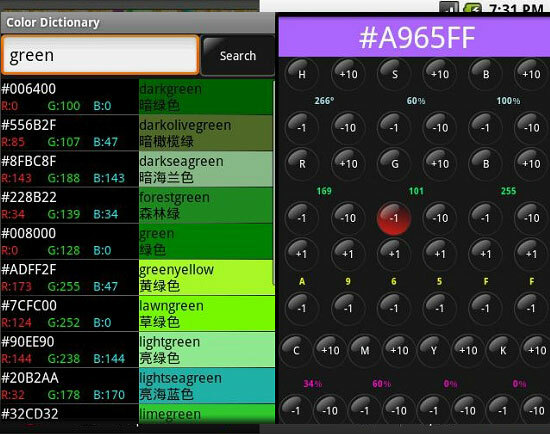 The Color Dictionary app can identify a color, or allow the user to select a color on a slider, and it will then apply a name to that color. Handy for all sorts of uses, whether choosing a website background or what color paint to buy for decorating your house! 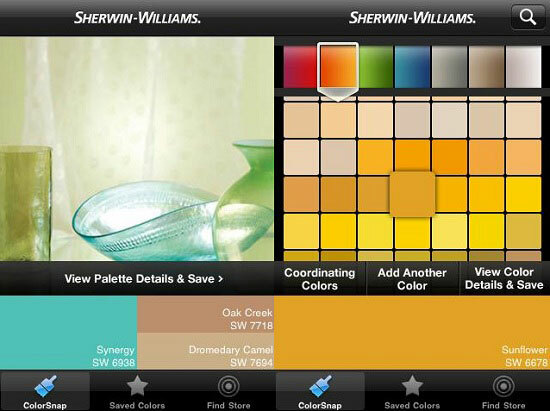 Similar to the Color Dictionary app, ColorSnap can capture colors from photos taken by your Android phone’s camera or pics from your library and identify them by matching to Sherwin-Williams‘ paint colors. The app is optimized for MDPI and HDPI phones and has never been tested on LDPI devices. It’s said to work well on old devices like the HTC Droid Incredible or the LG Ally, however, according to users’ reports, it doesn’t work well on Samsung’s Galaxy Nexus. In case you don’t like Color Dictionary and ColorSnap, Color Mood Designer is another app you can use to find the right color combination for your design project. 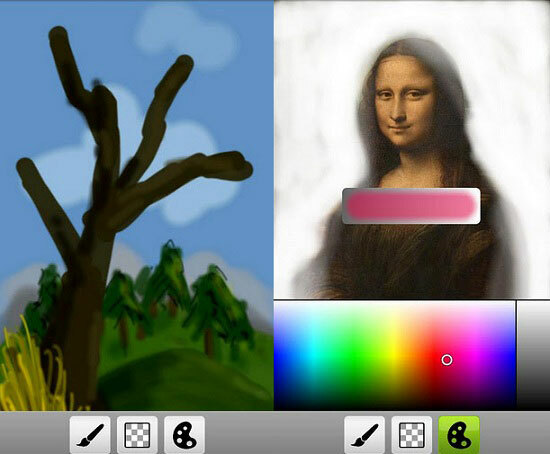 The title of this app can make you think it’s another color-choosing app, but no, it’s actually used for painting and drawing with a user-friendly interface that won’t distract or interrupt you. The Finger Colors app enables you to set the width, transparency and color of your strokes, so you can draw or paint almost anything you want, including oil and watercolor paintings (well, digital ones). 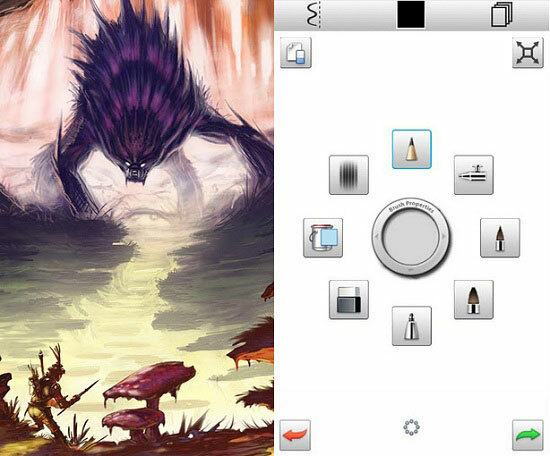 Similar to the previous apps, Autodesk SketchBook Express is a painting and drawing application with a huge range of useful tools. It works on smartphones that support multi-touch and run Android 2.1 or above; a powerful processor with a good amount of RAM will make the app run faster, but you can use it on mid-range devices like the Samsung Galaxy Ace, too. 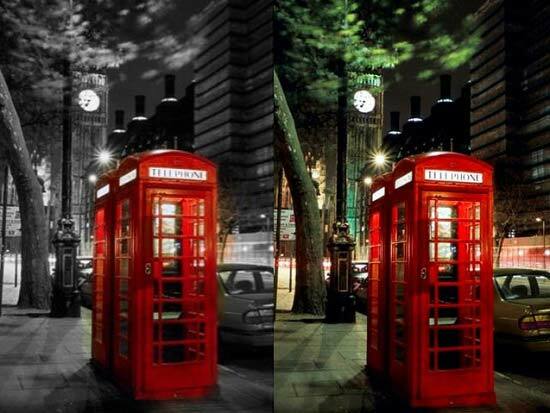 Fotolab is an application that specializes in enabling users to alter the effects and colors of an already taken photo. Selective color draining, blurring and effect creating are all available, plus more. The app is easy to use, and even allows the user to set an initial effect and then add patches for alternative effects with just the press of a finger. Photo Effects provides the ability to apply numerous effects to your photos. 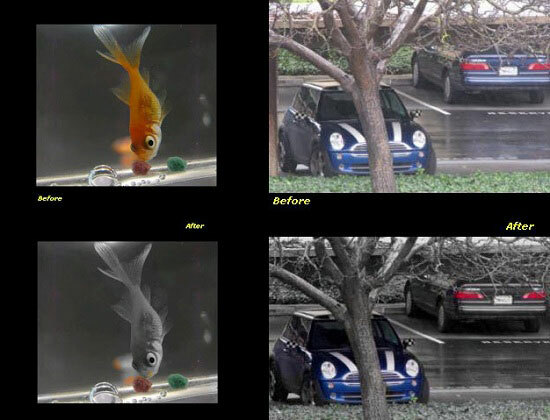 Whether it be thermal, fisheye, hazed or pixelated, this application can provide the edit that you require. Normal edits can be made to improve photos, or they can be made entirely wacky! Easy to use and control. Reduce Photo Size does exactly what it says on the tin. It can be used for editing image sizes, but its main use is to compress the actual file size. Many find that storing multiple images on their phone can deplete their memory rapidly, and so this app could be a useful solution to such a problem. 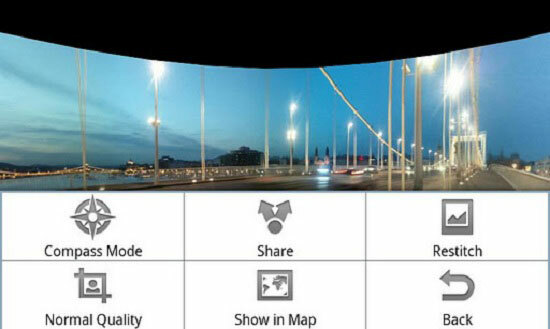 This application enables easy arranging of panorama-style shots. 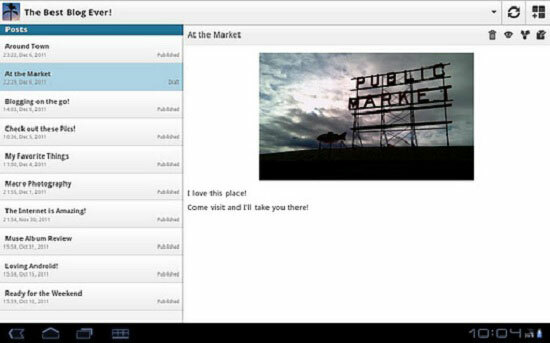 While Android 4.0 is likely to provide this function itself, anyone who requires panorama creation without the new operating system will want to use this easily controlled app. 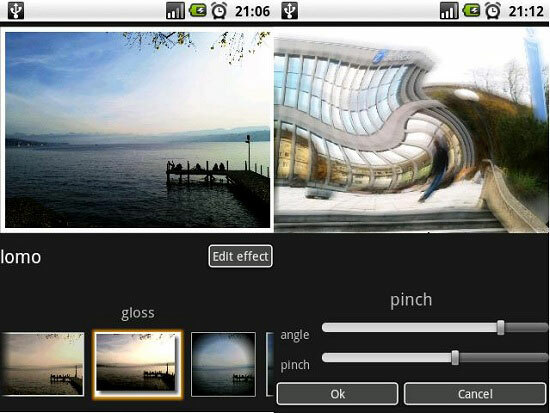 BeFunky is one of the most popular online photo editing programs, and now it’s available on Android, too. 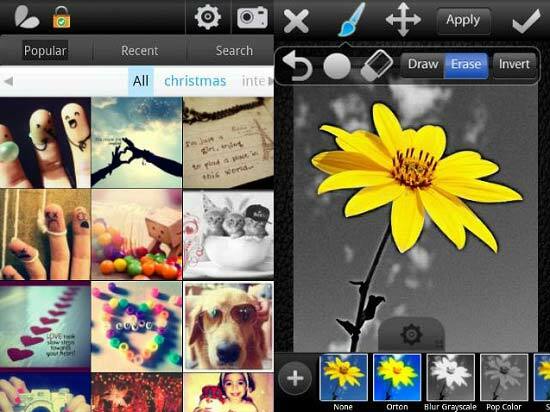 You can use the app to edit photos, apply different effects or add frames from the big collection it offers. PicsArt is one of the best and most complete photo editing apps that can be found on Google Play for free. You can use it not only for editing pics and applying effects to them, but also for drawing and sharing the works and the edited pics via Facebook, Flickr, Tumblr and a number of other social networking sites. It also adds new features to your smartphone’s camera and gives you the opportunity to take photos with effects the standard features don’t include. 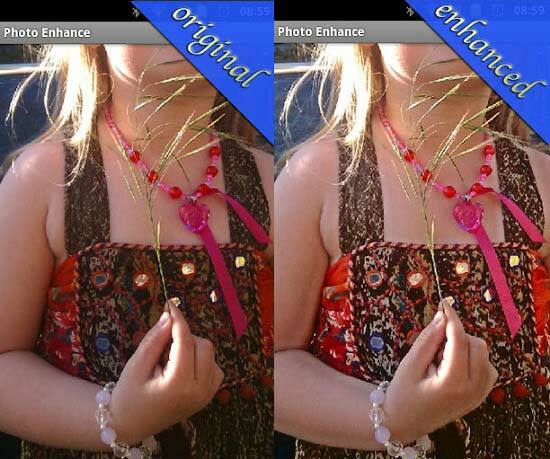 Photo Enhance is another good photo editor to easily adjust brightness, contrast, balance and colors of your photos and make them look more detailed, as if they were taken with a very cool camera. 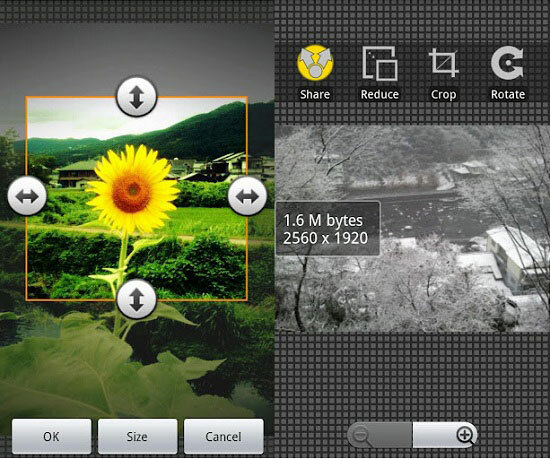 Many users look for apps that turn usual pics into black-and-white ones. But if you’re looking for just the opposite, Dash of Color will help you add colors to any kind of black-and-white photo. You can also use this app to convert any image to a black-and-white one and then add some selective colors of your own choosing. Most designers have to deal with fonts, and Fontroid is an app that can be useful in that arena. 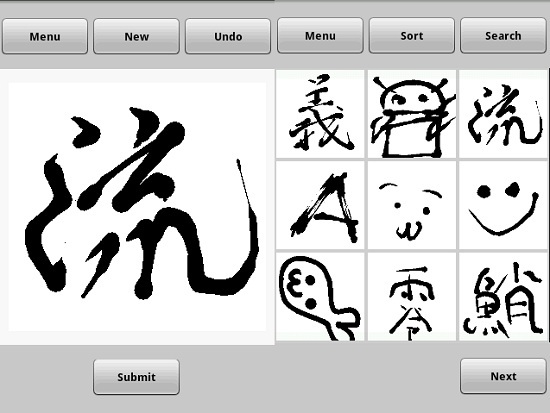 It enables you to draw and create your own fonts, upload them and share with your friends/colleagues. The best fonts become available for download from the official website in TrueType format. 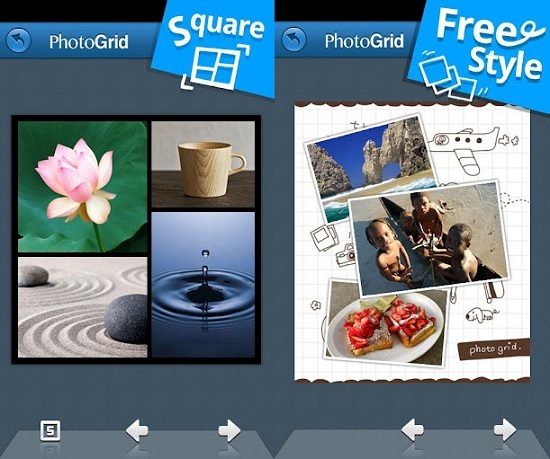 With Photo Grid by RoidApp you can turn your photo galleries into collages and easily add thumbnail photos for them. This is one of the most popular apps on Google Play with a huge number of positive user reviews, so you might find it worth trying. 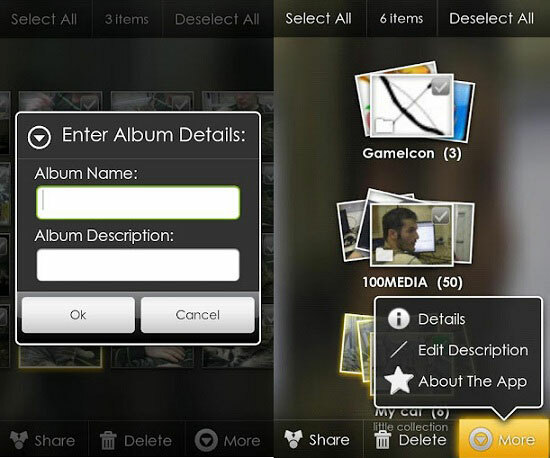 Gallery+ is an application that provides greater flexibility for gallery organization for the images on your phone. Android has been criticized in the past for not enabling this on the operating system supplied gallery, and so Gallery+ has attempted to rectify this in order to make the organization of photos more convenient. Features that brighten up the backgrounds and style of the albums also exist. PicWorld is a highly rated application that enables easy search of images across the Internet, using a variety of filters. Whatever photo you’re searching for on your mobile, PicWorld is likely to produce great results compared to manually searching through an Internet browser search engine. This app, brought to you by the computing giant Hewlett Packard, enables easy printing of documents that are stored on your Android phone. 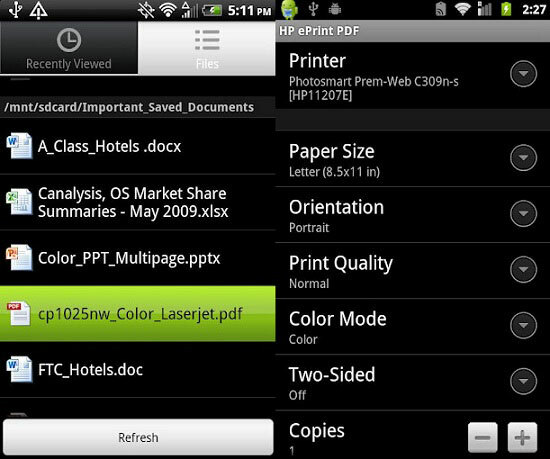 Rather than needing to transfer the file from phone to computer and then to printer, the app enables the user to print straight from the mobile. Saving time and headaches. So what are your favorite design related and image editing apps for Android, either ones that made the list or those that didn’t? Feel free to leave us your thoughts in the comment section below. We look forward to hearing your two cents. Amelia Hunter is a journalist who is also interested in design, mobile phones, apps and photography. Vignette and Camera 360 are more of a dedicated camera apps, while for photo editing none works better then Adobe’s product. Wish there was an app that could fix noise related issues..